Fairy gardens are only a step away from dollhouses and other miniature settings. Fairy gardens can be easily created as part of a dollhouse landscape or they may be created independently in a bowl, terrarium, wooden box or any other container that you can imagine. Many people opt to create a fairy garden outdoors in special corners of their property generally around trees or among their favorite flowers. Wherever you decide to place your fairy garden, there are just a few pointers to keep in mind. If you are entertaining the idea of creating a fairy garden in conjunction with your dollhouse, you will need to be a bit more cognizant of scale than you would if you were creating a garden independently. But like any work of art you are not bound by convention. I have seen many wonderful miniature creations in which the artist combined a variety of scales and sizes. The results are as magical as those that are created in accordance with strict perceived, standards of scale. The bottom line is create what feels right and makes you smile. When creating a fairy garden for indoor display you may find a greater variety of options and materials with which to work compared to one intended as a dollhouse garden. Your only limitations are probably space and budget. For indoor fairy gardens, your first consideration should be the container and placement within your space. Do you have room on a table or within a cabinet? Will the container you've chosen allow you to move it around the indoor space or do you intend that it become a centerpiece display? Should you want to install living plants within your garden, you will need to decide where the garden might receive appropriate sunlight for their survival. Once you've made these decisions, you can begin to collect those pieces that you find interesting and suited to your container. Again, there are no hard and fast rules, but if you begin with larger pieces like structures, you will less likely end up with more pieces than what will fit in your container. From there consider items like tables, chairs and benches or fences and arbors. At this point, I would recommend you consider the plants you will add to your garden. Keep in mind that you want slow growing plants that require only the occasional drink. Think succulents. You might consider adding bits of stone and moss to create pathways and fill for blank spaces in your tiny fairy landscape. 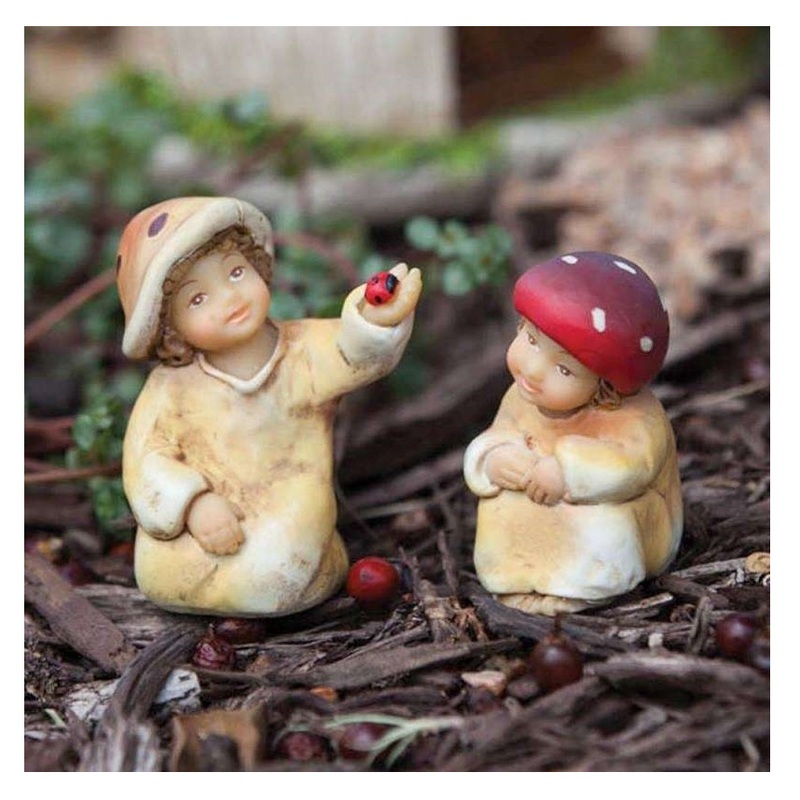 Explore your options for tiny woodland creatures (and naturally, fairies) to add life to your tiny garden. Arrange and re-arrange them until you are happy with their placement. Of course, you may never really complete your fairy garden world. Over time you will probably discover other items that would fit nicely into your tiny garden or you may discover you need to replace or remove a plant or two. An indoor fairy garden need not be stagnant or static, but a living, growing tiny place for joy and wonder. Should you opt to create a fairy garden outdoors among your trees and plants, you have a few other conditions to keep in mind. First and foremost is protecting and prolonging the life of the pieces you intend to include in your fairy garden. Remember, they will be exposed to the elements and potentially a prize for curious creatures. Unless you plan to deconstruct and/or remove your fairy garden each season or year, make certain that its elements are fairly impervious to the elements. They should be made of materials such as stone, resin, metal, and certain woods. All of these materials will better survive the elements if they are coated with a clear water resistant sealer that will help minimize deterioration and color fading. If you rather periodically replace elements or allow them to ultimately wither away, then sealing them won't be necessary. But most fairly gardeners want to enjoy their time and investments for as long as possible. Second, do you want a tiny garden that will hide among the plant leaves in a secluded corner or do you want a garden that is visible across the yard from your kitchen window? Elements for fairy gardens are as varied in size and scale as they are in the materials from which they are constructed. Third, have you considered how you will maintain your general landscape populated with tiny structures and inhabitants? Will you section it off from other areas that may require mowing and weed-whacking? There are no wrong or right ways to create your miniature fairy garden, but do consider these things so that you may enjoy your tiny magical space for years to come.